There are a variety of glasses available that are intended keep beverages cold. Since we happen to have several such glasses in shot glass sizes, we figured we’d put them all to the test and see which one works best. Since many liquors such as gin are typically consumed ice cold, how much does the type of glass affect the rate at which liquor warms? As a control we will use two standard glass shot glasses, one stored in the freezer and one at room temperature. We’ve seen in experiments where the goal was to cool warm liquor, that a cool glass can be as effective as other methods. 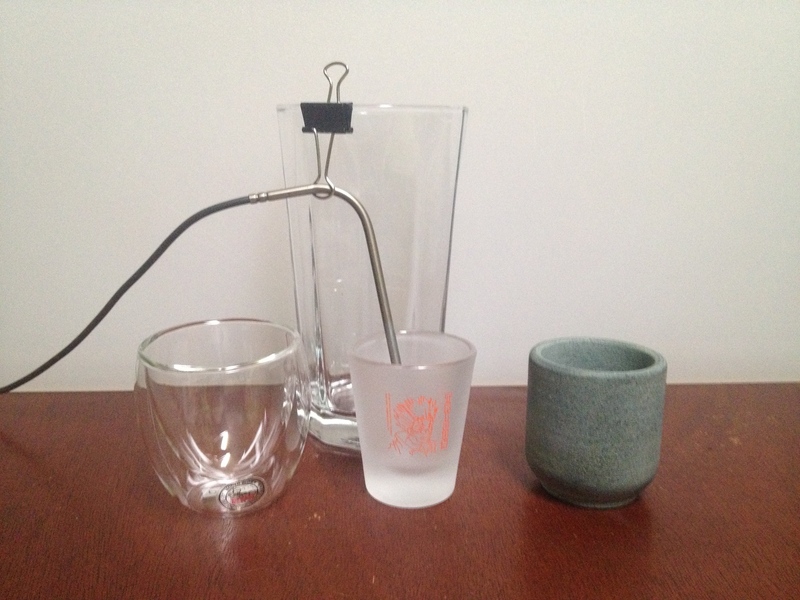 We expect that a cool shot glass should also help keep the gin cool, longer, as should a cool soapstone shot glass. Using an insulated shot glass should also help, but probably not as much as the gin will still have to cool part of the shot glass initially. A room temperature shot glass should warm the gin fairly rapidly. Place 1 soapstone shot glass, and 1 glass shot glass, and gin into freezer for several hours. Attach probe thermometer to tall glass using bankers clip such that it would rest just off the bottom of a shot glass. Place probe in the room temperature shot glass. Pour 1.5 fl. oz. of gin into shot glass. Record temperature for 20 minutes. Set gin aside, and repeat steps 3 through 5 with cold glass, cold soapstone, and insulated shot glasses. Use the gin to make two martinis (optional). Before starting, the elaborate temperature probe stand was assembled using a 17 fl. oz. glass and the binder clip. Temperature probe mounting mechanism along with 3 of the 4 shot glasses used. 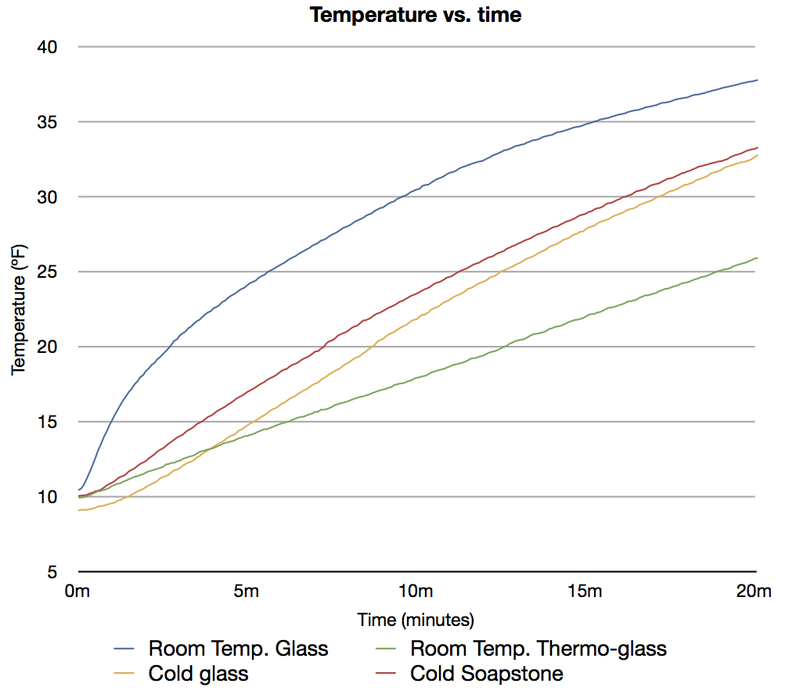 Since we only had one temperature probe, each glass was tested individually. During each trial the gin was returned to the freezer, to try to keep the initial temperature as consistent as possible. Temperature measurements were logged automatically every half second. The following graph shows the 5 second averages of the temperatures as the gin warmed in each glass. Temperature of gin over time in various shot glasses. The clear winner is the thermo-glass shot glass which started at room temperature and was the only one to still have the gin below 32ºF after 20 minutes. The cold glass shot glass was nearly identical to the specially made soapstone. The thermo-glass managed to keep the gin much cooler than any of the others. The ice cold soapstone and glass were about even with the room temperature glass shot glass doing the worst of all of them. This experiment was carried out using shot glasses. How would results differ with cocktail glasses that one would drink a martini out of.